CANTON, Mass. (January 28, 2014) – Valentine’s Day is all about sweethearts, and Dunkin’ Donuts is helping everyone enjoy the holiday with two fun and delicious varieties of sweet hearts. Beginning today, Dunkin’ Donuts, America’s all-day, everyday stop for coffee and baked goods, is celebrating the sweetest time of the year with the return of its beloved heart-shaped donuts. 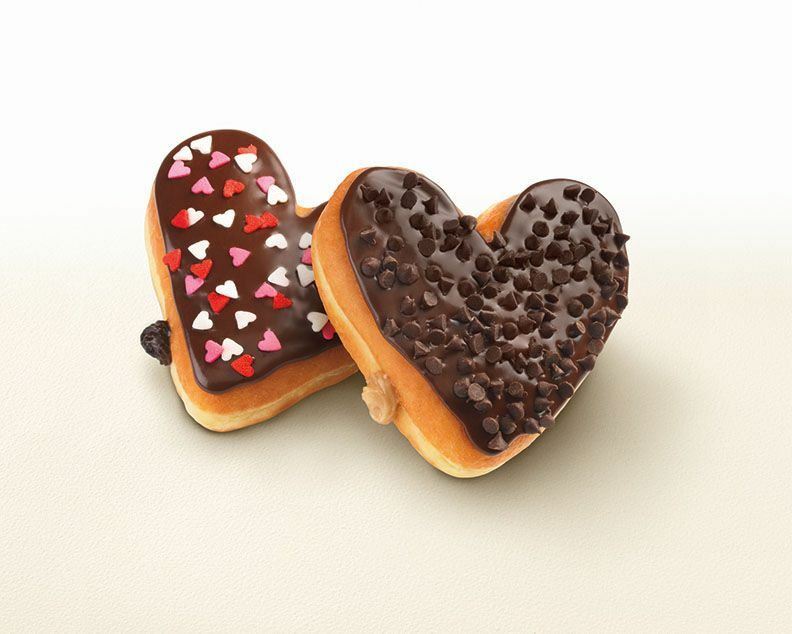 This year, Dunkin’ Donuts is spreading the love with two varieties of heart-shaped donuts, introducing the new Cookie Dough Donut and bringing back the popular Brownie Batter Donut. Dunkin’ Donuts’ new Cookie Dough Donut is a heart-shaped donut with cookie-dough buttercream flavored filling, topped with chocolate icing and chocolate chips. The Brownie Batter Donut is a heart-shaped donut filled with chocolaty brownie batter flavored buttercream filling, topped with chocolate icing and heart sprinkles. Both donuts will be available at participating Dunkin’ Donuts restaurants nationwide through the end of February. This Valentine’s Day season, Dunkin’ Donuts is serving up some sugar and spice for coffee lovers with its new Brown Sugar Cinnamon Coffee and Lattes. The creative combination of coffee and classic kitchen flavors creates a warm, indulgent taste bringing the richness of brown sugar and the sweet spice of cinnamon flavor in every sip. Dunkin’ Donuts’ Brown Sugar Cinnamon Coffee and Lattes are available hot or iced at participating Dunkin’ Donuts restaurants as the perfect pairing to any sweet treat. For a perfect Valentine’s Day gift for that special someone, Dunkin’ Donuts Cards are available in a variety of seasonally-themed designs. Dunkin’ Donuts Cards can be purchased at any participating Dunkin' Donuts location in amounts from $2 to $100, as well as online at DunkinDonuts.com, and at many grocery, pharmacy, and big box retailers. Dunkin' Donuts Cards always have no fees and never expire. At DunkinDonuts.com, guests can also personalize Dunkin’ Donuts Cards with their own photo and message.